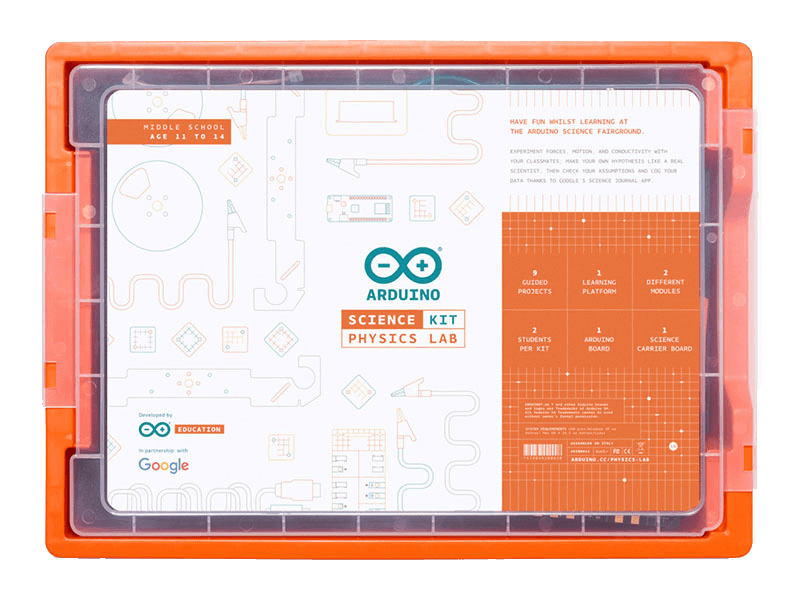 Targeted at middle schoolers (ages 11 to 14), the ARDUINO SCIENCE KIT PHYSICS LAB is the first official Arduino® kit designed for scientific exploration, developed in collaboration with GoogleTM. This kit enables students to explore forces, motion, and conductivity with their classmates. Students can make their own hypothesis like a real scientist, then check their assumptions, and log data thanks to Google’s Science JournalTM — a digital notebook for conducting and documenting science experiments using the unique capabilities of their own devices. The kit includes a range of sensors to measure light, temperature, motion, and magnetic fields; plus it comes with a set of props and full access to online course content for teachers and students to conduct nine exciting science projects based upon favorite fairground rides like the Gravitron and Pirate Ship. The projects featured in the kit have been aligned with the Next Generation Science Standard (NGSS) for K-12, and the National UK Curriculum.